Few cafes in Melbourne are open in the evening, let alone past midnight. Cafe Romantica in Brunswick is an Italian restaurant/cafe that is conveniently open at all hours of the night. 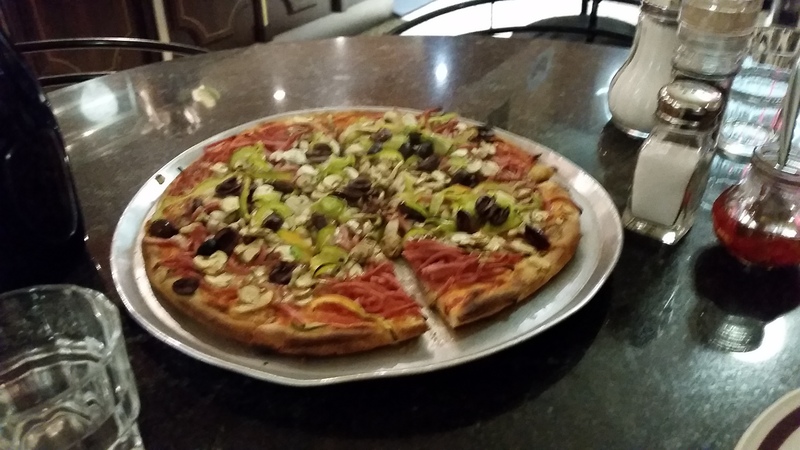 The extensive menu boasts pizza, including gourmet pizza, pasta, steak and more. We ordered a large peperonata pizza, which cost $16. The chief ingredients of the pizza were green capsicum, olive, mushroom and shredded ham on a tomato base. It was supposed to have cheese, but had very little and was instead loaded with mushroom. This was a pleasant state of affairs; a welcome change from how restaurant pizzas often have too much cheese and scrimp on the vegetables. Service at Cafe Romantica could do with some improvement. It appeared to be a case of too many staff and not enough communication. Our pizza took over half an hour to arrive; enough time for the people at the table beside us to come in, order, receive their food and leave. Having said this, you would not come to a late-night cafe expecting impeccable service. Cafe Romantica seems like the type of place where you would go to line your stomach with pizza or pasta at the end of a night out. Contrary to its name, it was not particularly romantic. The lighting was glaringly bright, and with raucous customers who appeared to be on their way home from a night out (on a Sunday, no less), it was quite loud at times. Featuring a pool table, pinball machines and large tables, Cafe Romantica is perhaps more suited to large groups rather than couples looking for a quiet bite to eat. Why? For a late night chat with snacks or a meal. When: 5:00pm - 10:00am, Tuesday - Sunday nights. Where: 54 Lygon St, Brunswick East 3057. Cost: About $20 for a meal. Interesting review, not what I expected with a name like Cafe Romantica. The pizza sounds delicious though especially the extra mushroom.